Wild flower prairie gardens are a good replacement for lawns, especially if you’re an adventurous gardener. It’s a big change from the manicured lawn and, yes, neighbors may raise their eyebrows. Our neighbors certainly did when we planted our 2-acre meadow. 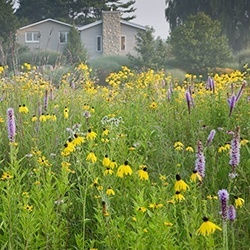 Prairie gardening with native North American wild flowers is part of the movement toward more sustainable gardening. This naturalistic style provides great backyard habitat for insects and birds that feed on them. What is a prairie meadow? Prairie is the French word for meadow – a plant community of flowering perennials and grasses growing together. Prairie landscapes are natural to mid-western regions of North America. Today very little original prairie remains, but restoration projects are underway in many regions. If you’re considering a wild flower garden to replace a strip of lawn or a flowerbed in your backyard, it needs to be in full sun. As for the plants, if your yard is small, the best way is to start with young container-grown plants, which bloom much sooner than a meadow from seed. Wild flower seed for prairie plantings is also available and is, of course, much cheaper than plants, and more practical for larger projects. We planted our meadow from seed. 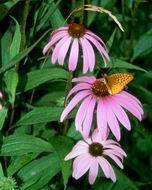 Remember, with seed, most of the plants take three seasons to reach blooming size. This is typical for seed-grown perennials, so you need to be patient. As for the neighbors, here’s how to keep them happy: be sure to keep a neatly trimmed border of lawn around your wild flower planting.